In 1919 America was still recovering from from the Great World War. Price inflation and the cost of living had increased far beyond wages. Men back from the war flooded the labor market which further diminished workers' earning power. During this year, one fifth of the country's workers would strike. The year started with New York's harbor workers striking in January, followed by dressmakers. In February news headlines reported a "prelude to revolution" when a general strike in Seattle closed all business February 6 to 11th. Bombs were mailed to the mayor of Seattle who broke the strike, and in April, forty more mail bombs were found en route to other public leaders for May Day. With the backdrop of apparently spreading communism, many patriotic Americans believed they were on the verge of a workers revolution. In Massachusetts, textile workers in Lawrence walked out in protest of six day, nine hour work schedules. Boston telephone operators interrupted much of New England's phone service in an April, and in July Boston's elevated train workers went off the job in their own protest. Boston's political and business leaders could see this national trend of strikes disabling their own businesses and communities, and they were alarmed. There is no doubt that Boston's police had grievances, which they expressed as early as 1917. New officer pay had not risen in sixty years, since 1857 when new recruits received two dollars daily. Officers worked seven days per week, with a day off every other week during which they couldn't leave town without special permission. Depending on duty, officers worked between 73 and 98 hours weekly, and were required to sleep in infested station houses kept in deplorable condition. Since 1885, the Boston police were under the command of a commissioner appointed by the state governor. Though Boston's mayor controlled their budget, their operation and how they used the budget was controlled by a commissioner appointed by the governor. This placed the mayor, Andrew Peters in a difficult position. His city was protected by a force not in his control. When they would succeed the state took credit, when there were problems he was closet to them. There was also an ethnic overlay. Protestants Yankees sought to control the Irish-Catholic rank and file of the Boston Police Department. This made the dispute about more than wages or work conditions, it quickly broke along lines of ethnicity. By June of 1919 the grievances made by the police had not been addressed. They turned to the American Federation of Labor to consider unionization. Police Commissioner Curtis was outspoken in his condemnation of the movement to unionize. In August they would be granted a union charter, which Commissioner Curtis would oppose on the grounds that police were not "an employee, but a state officer." Mayor Peters was unreachable on an extended vacation in Maine, but Governor Coolidge and Attorney General Albert Pillsbury put forward legislation to make unionization illegal for public employees. Pillsbury would note that the "organized work man has taken us by the throat and has us at his mercy". The lines of "us" and "them" were drawn quickly. From this point on, state officials focused on the legitimacy of public employees unionizing rather than the validity of the officers complains. On August 20th commissioner Curtis suspended eight of the leading police union organizers, followed soon by another ten. The rank and file were ordered to turn in their nightsticks, and Curtis began to organize volunteer police substitutes. When mayor Peters returned from vacation he made conciliatory statements, and organized a commission headed by prominent banker James Jackson Storrow. The commission came to the expected conclusion, that though wages and working conditions required change, it would be inconsistent with public interest to negotiate with a union, or have the police obliged to any non-public organization. The majority need for public safety outweighed the officers asserted right to collective bargaining. The police were emotionally committed to the union as the only effective means of making progress. The vote to strike was within five votes of unanimous, and was seen in Massachusetts as the climax to a year of violence and threats. Senator Henry Cabot Lodge described the strike as "the first step to sovietizing the country". Governor Coolidge suggested that the city council raise wages and improve working conditions. Still, Coolidge's commissioner held firm to his position, and recruited about 200 Harvard athletes and business men to step in during the expected strike. Mayor Peters requested that Coolidge dispatch the state guard as a first reaction to the strike. Coolidge sided with his police commissioner who advised that volunteers could fill the void, and that troops should only be sent if needed. On the evening of September 9th the strike took place as planned. Nearly three quarters of Boston's police left their jobs. As residents absorbed the reality of the absence of police, the mischievous among them took the opportunity to engage in petty crimes. There was gambling in public, harassing officers: both those on strike who were now without badge and gun, as well as those who remained as strike breakers in the greatly weakened force. By 8pm a crowd estimated at 10,000 gathered, as pictured here, in Scollay Square. Soon a cigar store window was broken and emptied. This was followed by a frenzy of looting, gambling and mayhem downtown and in South Boston until after 1am. That morning political positioning ensued. Mayor Peters issued a press release saying he was not to blame, and he called out the state guard. He used an emergency clause to take control of the police whenever "tumult, riot, and violent disturbance" happened within the city. 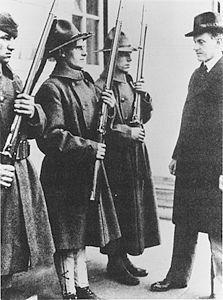 Coolidge reacted by issuing a statement that as Governor the guard would be under his control, and that Coolidge not Peters would save Boston. The President of Harvard, Lawrence Lowell called on more students to volunteer, as did Boston's businessmen. Crowds waited outside police stations to attack the volunteers. Cries were heard of "kill the cops". The Commander of Station 6 in South Boston kept his Harvard volunteers in the station to protect their lives. At Scollay Square there were sporadic confrontations between the replacement police and crowd, resulting in several Harvard students being cornered. When the first troop of cavalry arrived they had to intervene to rescue groups of cornered police. Several guardsmen were injured by thrown rocks, but eventually the threat of live ammunition and horsemen with swords pushed the crowd from Scollay Square. Boston a hive of military activity. At the old armory near the Park Plaza hotel mobile units with machine guns set up headquarters. The guard forces kill five residents, while three more would by killed by civilians. Over twenty people sustained serious wounds. The next morning the LA Times wrote "...no man's house, no man's wife, no man's children will be safe if the police force in unionized and made subject to the orders of Red Unionite bosses." Mayor Peters feared that a general strike such as the one which closed Seattle would follow with the support of other unions and public employees. With order restored, he met with union leaders to seek compromise. Governor Coolidge could afford to take a firmer stance, as ultimately he would not have to lead the city through a general strike. Further he had a supporter, "Diamond" Jim Timilty sitting inside the Central Labor Organization who secretly promised a general strike would not be made. When the Police Union asked that the officers be reinstated so they could protect the city while a new contract was negotiated, Coolidge rebuffed by refusing and stating "there is no right to strike against the public safety by anybody, anywhere, any time." Labor was plentiful, by mid-December Commissioner Curtis had hired an entirely new police force at increased wages and with better working conditions. The state guard was was able to return to their homes, and no striking officer returned to the Boston police force. Governor Coolidge was easily reelected on November 4th, 1919. A year later he would become Vice-President of the United States, and following the death of President Warren Harding he became President on August 2, 1923. Mayor Peters would be defeated in his next election by his political rival James Michael Curley, who had preceded him as Mayor.